No Matter What Kind Of Commercial Roof You Have, We Can Assist You With the Replacement. Are you noticing issues with your business' commercial roofing, such as old age or extensive problems? As your building's commercial roof ages, it starts to suffer from UV damage, as well as weakened seams that can lead to water leaks. In situations with recurring issues and regular problems, it may be a smart move to replace that aging roof! 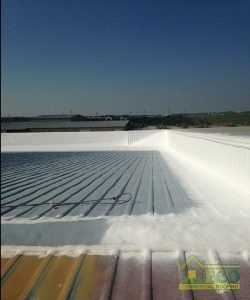 For a long time, ECO Commercial Roofing has supplied this community with professional roofing solutions, and we are known for our commercial roof replacement in Texas, Louisiana, and Mississippi. To speak to one of our expert roofers, contact us today at (833) 200-0571, and schedule your commercial roof inspection and quote. Since a complete roofing replacement will be a big project, our roofers do what they can to make sure replacement is the ideal choice, by conducting a comprehensive assessment. In some cases, aging roof systems can be treated with a roof coating instead of replacement, though that varies according to the condition of your existing roof system, along with the structure of the commercial building. Aside from common issues like severe UV damages and cracks or sunken areas, our contractors check for more subtle signs of problems as well. For building owners that inspect their own roofs often, keep an eye out for those issues, along with any irregularities on your roof, and call us to address your commercial roof replacement needs. You can choose typical options such as EPDM from our wide variety of roofing materials, or even consider more advanced roof systems like as PVC. No matter which kind of roof you have currently, or the kind of roofing you are looking to add, our expert contractors have the experience and materials to assist you! Our contractors implement a fast and efficient method for removal and installation in order to accommodate your daily business proceedings as seamlessly as possible. Each of our contractors are trained and insured to provide a superior level of service and safety to every client. Schedule your inspection and request an estimate for expert commercial roof replacement in Texas, Louisiana, and Mississippi today by calling (833) 200-0571!